The big S&P 500 index hit new all-time highs last week, edging slightly above the previous high-water mark that was set back on March 1. That milestone may be a relatively small one, but it's sending a very important message to investors in 2017: The uptrend is back on. After a two-month stretch of sideways price action, May is bringing back higher market highs. And, while the market inches its way higher this month, some of the individual stocks that make up those big stock indices are doing substantially better. To figure out which stocks to buy this week, we're turning to a new set of "Rocket Stocks" worth owning. In case you're not familiar, Rocket Stocks are our list of companies with short-term gain catalysts and longer-term growth potential. To find them, I run a weekly quantitative screen that seeks out stocks with a combination of analyst upgrades and positive earnings surprises to identify rising analyst expectations, a bullish signal for stocks in any market. After all, where analysts' expectations are increasing, institutional cash often follows. In the last 399 weeks, our weekly list of plays has outperformed the S&P 500's record-breaking run by 79.07%. Jim Cramer talks about oversold retail stocks on Real Money. Get his insights or analysis with a free trial subscription to Real Money. So, without further ado, here's a look at this week's Rocket Stocks. 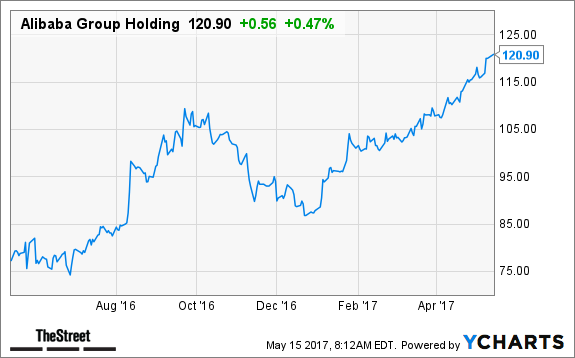 New highs have been nothing new at all for investors in Alibaba Group Holding Ltd. (BABA - Get Report) . Shares of this $300 billion Chinese e-commerce giant have been outstanding performers in 2017, up more than 37% since the calendar flipped to January. And there's reason to expect that momentum to continue this summer. Alibaba is the biggest e-commerce company in the world, based on gross merchandise volume. The company owns the most popular online marketplaces in China, including namesake Alibaba, web marketplace Tmall, consumer-to-consumer sales site Taobao, and daily deals site Juhuasuan. Alibaba also operates a payment network and a suite of cloud computing products. Alibaba benefits from a virtuous cycle: with more than 443 million active buyers, the firm's marketplaces attract sellers who want a big audience to market to. Likewise, buyers keep coming back because of Alibaba's selection of merchandise. In total, the firm counts approximately one third of China's population as customers, an edge that's incredibly hard for newcomers to replicate. Keep an eye out for earnings at the end of this week. It might be surprising to see Nvidia (NVDA - Get Report) on a list of potential Rocket Stocks right now -- after all, this stock was the single best-performing stock in the entire S&P 500 in 2016, and after a substantial triple-digit up-move, investors are understandably squeamish about getting in now. But the reality is, Nvidia's massive upside didn't suddenly end with the calendar year; this stock has been charging higher in 2017, and it's not too late to participate in the upside. 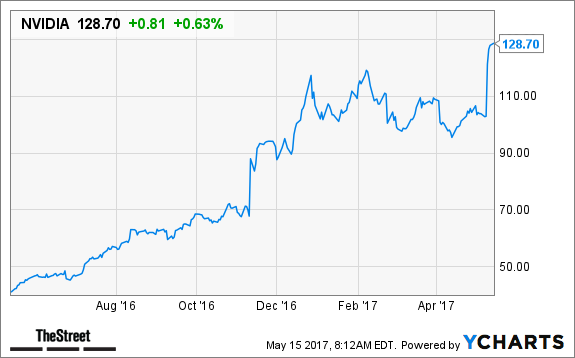 Nvidia is a semiconductor stock that focuses on graphics chips. The firm's chips are used in a variety of applications, ranging from high-end gaming PCs to intense data-processing applications to automotive infotainment systems. Newer business lines are an important part of NVDA's growth story. For example, as graphics processors are increasingly used to perform complex mathematical computations, Nvidia is growing its exposure to the datacenter business, a chunk of the market that historically hasn't been a focal point for the firm. Likewise, automotive infotainment presents a big opportunity, as cars pack more graphics and data accessible to the driver with every model year. Even as auto sale growth stalls, there's a large growth opportunity in supplying graphics chips for the automotive segment. Shares broke higher last week on Q1 earnings -- it's not too late to grab onto that momentum boost now. Hotel chain Marriott International Inc. (MAR - Get Report) has been a stock in transition lately. After closing its major acquisition of the Starwood family of luxury hotel brands back in September, the firm now operates 1.2 million rooms across 30 brands. That added room count exposes Marriott to some of the most attractive corners of the hotel market right now. Marriott's properties are overwhelmingly managed and franchised, with about 98% of the firm's rooms fitting under that category. That model means that Marriott doesn't actually own the property, plant and equipment at its hotels the vast majority of the time, an asset-light model that generates sticky, recurring fees with reduced capital requirements. The firm's purchase of Starwood also increases its exposure ex-U.S., shielding Marriott from some of the negative implications of a downturn in the North American travel segment. Buyers are clearly in control of Marriott's price momentum right now. And with rising analyst sentiment in shares this week, it makes sense to bet on this Rocket Stock.